Have you ever wondered what it's like to participate in a research trip to a long-gone logging company location? 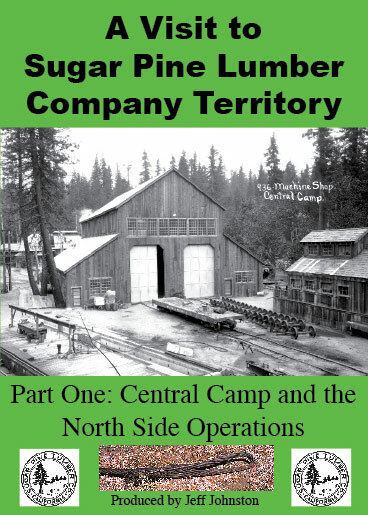 "A Visit to Sugar Pine Lumber Company Territory" takes you along on an adventure in the area where the SPLCo operated during its brief but spectacular time in business during the 1920s. In May 2009 a group of SPLCo enthusiasts spent some time in the woods exploring the old SPLCo grades, Central Camp and what we call the North side operations. This video lets you join them as they drive the old right-of-way, view some spectacular scenery, explore the remote woods camp locations, and ponder over artifact finds in the woods. They camp at Camp Whiskers, have some terrific mountain meals and generally enjoy one of the best parts of being involved with logging railroad history and research. It's not all dusty archives and too much basement time. Getting out there with friends is a fun way to spend time together while learning more about a company that's been gone some 75 years and counting. Ride along with the crew and enjoy the adventure! *International shipping is an additional $5.00 per DVD. *US shipping is an extra $3 per DVD. Those who purchase this DVD are eligible for the free upgrade. In 2010 we plan to make another trip to cover the South side area that includes the inclines, remote woods camps and end-of-operations sites near Source Point and elsewhere. This second adventure will be added to the DVD available today. Mail the original DVD (not the packaging) back to us, along with $4.00 for shipping, and we'll return the updated DVD that includes both parts of the adventure for free! If you're interested in joining us in the woods for the event, drop us a note at the "info@..." address on this site.